There's only a week left to for the last event in KC. So it's time for some reflections and commiseration. well, the clearing rate of are 90-95% for E1-4, 90% for E5, 85% for E6 and 70% for E7. That would mean around 43% of the people who started E1 cleared E7. Most people picked Hard in E1-3. First two most popular choices for E4 are easy and med, while that for E7 are casual and hard. Well, still a week worth of event time, so that looks like a decent clearing rate for me. Finally cleared everything, with a full Hard clear. It felt worth it reaching the end, with the song especially. I'd be happy to retire from Hard clears after experiencing that. While everyone's raving about Musashi's auto-kill potential and Zuihou's god-like night battle bonus for the final map, this event was still all about Zuikaku thematically for me. She sounded the most desperate out of all the historicals, she had a total wardrobe change, and she seemed pretty close in demeanor to her abyssal version. In fighting this battle and trying to change her history, she came up to the mirror and saw herself starting back like a nightmare. I think it's a great story. Even though I felt it was a little excessive over the existing historical bonuses, I also found Shokaku's extra bonus over all the other ships versus the boss to be a nice touch. The older sister has her own resolve too. I found the friend fleet idea pretty interesting. They said it's a preview of the new feature in future where we'll be able to use other player's fleets, but I wonder how that will work. Many fleets seemed deliberately gimped by using gun/torp CIs for example, though I surprisingly found the ones equipped with the destroyer radar CI to be pretty useful. Player fleets could be much stronger than these. So lets see. That said they added a great thematic addition to the event. Seeing fleets like the Egano or Nishimura fleet come with their voice overs in is really hype. If NPC fleets go away, that will be a shame. The voiceover lines kept me going at times. Total expenditure was some of the highest I've ever spent. Must be because of my usage of Musashi simply everywhere, plus the three LBAS bases bleeding resources like mad to sorties and enemy air raids. I never noticed it before, buut LBAS costs make up almost 1/3rd of my total event fuel costs. Real-life situation means I'll probably never reach 300k fuel/ammo again from where it is now, but that's fine. I managed to continue my goal of having every shipgirl. I grabbed every one of of the new ships, and I probably lucked out amazingly by getting Tashkent on my LD killing run at E6. All in all, it's been a pretty likable event for me, and felt like it has properly ended KC 1.0 too. Now for the bad, and sadly, its not about the game. I will likely not participate in Himeuta anymore for KC event related things, depending on how KC 2.0 turns out. More and more I seem to find only two groups of people, one which views the addition of new mechanics frustrating, and another that finds them cheapening the difficulty. It's pretty ironic that both extremes exist, and it's hardly due to a gap (which does exist) between players who have and have-nots, rather its from the veterans crowd. Maybe i'm just lucky to fall in the middle, but I feel as a result I see people getting upset over trivialities, as if they are actively looking for a reason to quit. Appreciation for the girls and the thematic components is at an all time low, precisely when the events are starting to focus on such things more. And with a sprinkling of complaints about the game being too old. My thanks to those who helped me and other players, especially @211303 and @NanashiYoukai, among others. I feel like I should brush off the negativity like them, but I'm not that kind of person. Though I feel bad that I'm throwing in the towel when others still put in a lot of effort here to make Himeuta a great place to be.. Hopefully, when KC 2.0 hits, I'll have a reason to keep posting. That's the saddest part really, we don't know for sure yet if KC 2.0 is going to be a total/partial revamp or a simple port. I'm sure I'd be fine with either, but I suspect it which would determine if this group, not the game, is worth coming back to for me. Pretty sweet event this round. I definitely like the historical bits since they rewarded people to use different ships rather than use the same few ships every event. Although it does get excessive at times and most of the ships with the buffs are part of most people's clearing fleet every event anyway. I do hope for more of similar instances in the future, especially if it highlight ships that rarely (if ever) see action in other fleets. I believe that would bring alot more variety and options when it comes to event fleet compositions. Cleared on: E-1H, E-2H, E-3M, E-4M, E-5H, E-6E, E-7C. I was originally going to clear E-7 on easy instead of casual despite warnings that it would be harder, but I was kinda lacking time since something unexpected happened so I took the faster route, not much regret doing so. Although this time the final map is definitely unforgiving enough that I cannot clear with a full DD comp (Kinda gimped it to only a 6DD fleet) due to the boss armour and the LOS issue (I miss no-los check to boss last event...). Overall still a satisfying win since I did manage to use all 6 Ringed destroyers on a final map clear. Not the way I wanted to end KC1.0, but its definitely a fitting substitute. I was definitely glad to get the night flying thing from E-4M, which also allowed me to get all the awesome DD stuff in E-5. Farming E-5 was a little tough later on, but its definitely worth it for the shiny new DD toys (and one more 12.7D, yay~). Got all the new girls this round, which included a spare Jervis which I probably will train for one more british gun and ASDIC, so ship wise its a win for me too. Really lovable girls this event, they would make a great addition to my fleet. Another thing about this event is that due to difficulty of certain maps (Looking at you, E-4M), I came to appreciate stuff I never cared about about much prior to this event, a few equipments and ships to name a few. But special mention definitely goes to the Type 1 Fighter Hayabusa Model II (64 Squadron). When I first get it by clearing E-5H during spring 2017, I told myself never to use it, since I cleared the map in a way I didn't accept, I wanted to pretend I never got it in the first place. This event kinda forced me to use it, and I will be honest to say it definitely saved my skin more times than I can count this event. I probably will go back to using this only when absolutely necessary, but its definitely the one equipment I was really glad to prepare before this event. And definitely got to thank the bunch of people who helped me with my clears, be it giving me tips and advice or just emotional support. They are definitely important to me during the very few times over the event when I need it. Kinda too many to name, and I am not sure if some of them even frequent here so I spare the name-tagging. Last edited by Zalfier; 03-18-2018 at 03:16 PM. Cleared the event on HHHNHHH. That N was a moment of weakness in the rage and confusion surrounding Intrepid's reveal. But oh well. That's what it cost me to do the whole event. The first dip was from farming Jervis. Fun fact, farming Jervis still cost more than my E7 clear. "5%" drop rate. Luckily Hamanami and Tashkent didn't cause me that much grief. All new girls rescued so I'm happy. Slightly disappointed I didn't get any dupe Iowa but I'm not going back to that map. All in all a pretty fun event. The devs went all out with the atmosphere building this time with all the comments at the empty nodes and that ending song. First and foremost, I would like to thank Himeuta staff, all the front-liners, those who took the time to posts comps & give advice, @211303 for the walkthroughs, @NanashiYoukai for walkthroughs/farming guides, and @Leyana for E-7 help. Much appreciated as always. Actually, if anyone knows those who work on KC Wiki/Wikia, please extend my gratitude as well. Lot of work with that and it should be acknowledged IMO. As for this event, not going into any long comments. It had its good points (e.g. music (as usual), attention to detail such as event CG/voice lines/ending, the new mechanic to save progress if you go down in difficulty). And yes, sorry, but there were negative aspects as well IMO, but I'll forgo getting into specifics. Lastly, zero complaints about my personal results. Got all new ships and all equipment (minus one AAR. *shrugs*). Not afraid to admit got lucky when I needed to at the end. Clearing E-7 Hard was a nice way for me to end "KC 1.0". Best of luck to any who are still trying to clear! @Leyana: Yeah, this was easily the most expensive event for me and I really didn't do that much farming. I also did E-4 on Medium as well, and still burned at least 200k fuel. >_<. The devs went all out with the atmosphere building this time with all the comments at the empty nodes and that ending song. Absolutely agree on the level of detail and touches. Unfortunately for me, since I'm not fluent in Japanese, much of that is lost (e.g. all the empty node comments), but I can still appreciate on some level. For example, one could pick up just from tone/inflection for the ending lines. @goesto11 If you're curious about the node comments and the ending lines/song. Cleared everything on hard except E-4, also got every new ship with relative ease. The event had some rough bumps along the way but I managed with my sanity - not with my time though. From the "lore" standpoint I've found the event a bit emotional and fun; on the gameplay aspect I find it rather obtuse. Two maps which are basically carbon-copies from previous event is quite lazy from the devs even if it's Leyte, and the stupid artifical delays from half the maps drove me nuts. Every map now had a long gimick with boring requirements, nothing new. ...And then there's E-7 with the gatekeeper blocking us from entering the castle of our arch enemy - the proud Water Demon Kai stands armed and 305 armor ready. E-4: The worst not final map I've ever had the displeasure to experience from every event I've been through; it's pure hot garbage, with resource consumption being the greatest offender. E-6: Who thought that having 3 bosses in 1 map each with their own health bar was a good idea? Why did I have to kill them multiple times instead of only once to clear their bar, and finally get on with the true boss? I really hated how long it took to clear this one. E-7: Without the friend fleet the first part nearly crosses last summer's RNG-fest, without the ridicilous preboss nodes of course; but after we beat her comes the disappointment... the big baddy is nothing but a frail little girl with a walking frame - her weak arms can barely form a tight grip around her support. A: Abyssal Zui either gets bombed to high hell by Zuikaku. B: Musashi snaps her in half. 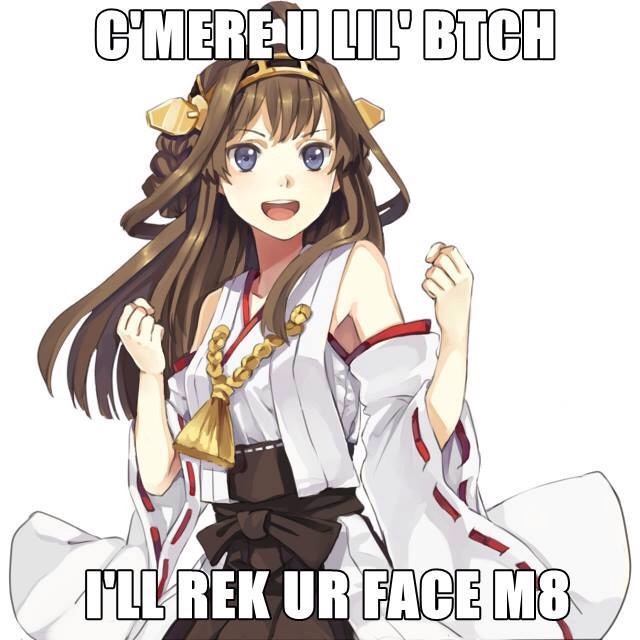 C: Replace Zuikaku with Zuiho in NB. My resources were capped with bauxite being around 220k. I'd really like to go back to previous events as this event was waay, waaay too long for its own good; wish we could get back the events which took 3 days tops to clear and not... this. @Leyana: Thanks. I'll check that.out. Even without the TL I thought the end song (melody, way it was sung, etc.) was well done. @ardiel: That's a nice list. GL on the rest of your farming. I think I'm not doing maxed for the events as I obviously lack the necessary equipments to make the event on Harder dificulty doable. Truly this event caught me in a hectic time at my work so I only managed to do them during weekends, with no time to really replenish my resources. Now that is done replenish resource and levelling my kanmusu is my top priority the next will be to upgrade my equipment as I lacked plenty of them.